Jill Bauman is passionate about solving family homelessness. Seated in her art-lined and book-filled living room, Bauman recounts the road to becoming head of Imagine LA, the non-profit agency that is using creative methods to remedy the homeless dilemma. Born in Pasadena and raised in Santa Barbara, she briefly lived on June St. Bauman graduated from Smith College with a degree in economics and received two masters degrees in business administration and public policy and management from Yale University. Bauman went into computer system design (“I was one of the first to use an Apple Mac”) and later became an investment banker. She has launched three businesses, been a board member of several nonprofits including the co-founder of the Weingart Center “Weingart Partner” young professionals group. Her resume also includes developing an adopt-a-family program and a transitional housing facility for women and children. But it was when Bauman joined Imagine LA as a board member in 2006, in the second year of the agency, that the Windsor Village resident found her niche. 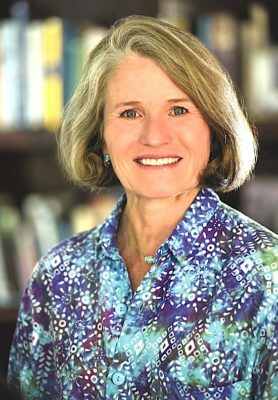 Bauman was able to combine her concern for women’s issues with the problem of homelessness. A year later, the president resigned, and Bauman was asked to take the reins. Mentors are always needed. Their roles include contacting their families weekly, helping them with budgets, tutoring, nutrition and taking them on outings such as to the Los Angeles Zoo, picnics and festivals. The Bauman family moved to the area 10 years ago, and Bauman is thrilled to be part of this community. “In addition to local board members, we have the support of groups like NGA, Big Sunday and The Ebell of Los Angeles,” she said. Her friends at the Los Angeles Tennis Club also donate or volunteer to the agency. Bauman is ranked an “A” player and also keeps trim by swimming. Husband John is a literary agent “and a gourmet cook.” He also founded the Shakespeare Company that gives free performances in Griffith Park. Isabelle, 19, is a student at Brown, and James, 17, attends Loyola High School. Some summers the family will be at Ashland, Ore., to see the enactments of the Bard’s works. The Bauman backyard is a retreat for Jill where she relaxes and enjoys viewing the stone labyrinth the family has created. It’s here she can reflect on the success of Imagine LA in helping end the cycle of homelessness. For more information, go to imaginela.org.